There’s nothing quite as romantic or unforgetable as an Oregon proposal during the fall. The air is crisp, the trees are changing colors, and somehow the sunrises and sunsets are more brilliant than usual. As Portland’s full-serve boutique jewelry store, we’re proud to help Oregon couples find the perfect diamond engagement ring. Over the years, we’ve heard many engagement stories featuring stunning PNW locations. 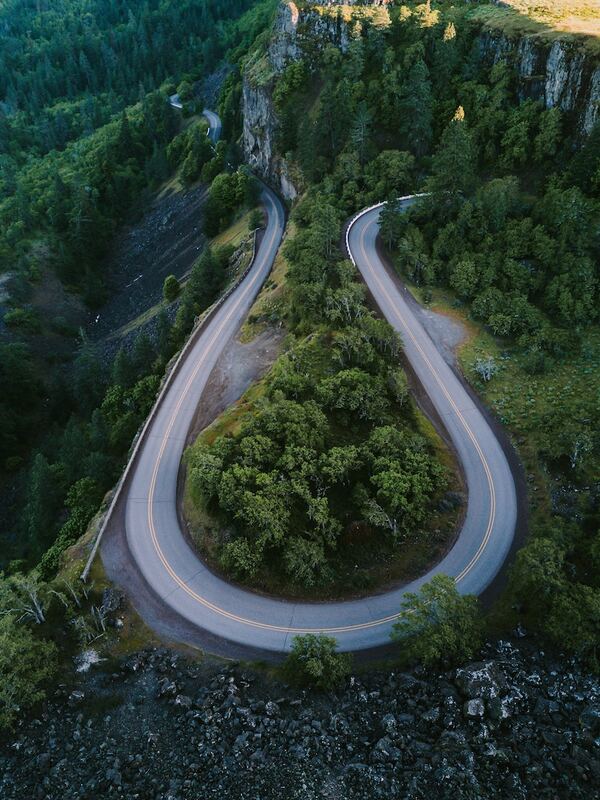 Keep reading for our list of favorite Oregon locations that make the perfect outdoor setting for a fall marriage proposal. 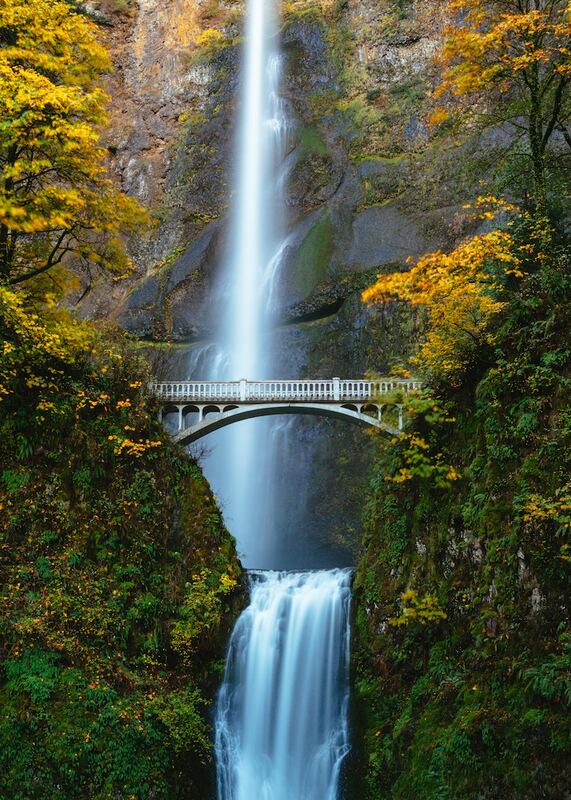 Tucked back off the Columbia River Gorge, the historic Multnomah Falls attracts over two million visitors from around the world every year – and it’s no wonder! Spanning 2 tiers of basalt cliffs and reaching a height of 620 feet, this is the tallest waterfall in the state of Oregon and is a truly magnificent sight. Go on a weekday: People visit the falls everyday, but the area is significantly less crowded on a weekday. Go early in the day: Consider an early morning proposal! Hike to the top of the falls: Most visitors congregate at the base of the falls, so sneak away to the the top of the falls (a 2.2 mile hike). Hike to the top of Wahkeena Falls: If you’re an especially adventurous couple, hike the 5.4 mile loop up 1600 feet to the top of Wahkeena Falls. Haystack Rock is another recognizable Oregon landmark and a beautiful setting to get down on one knee. This massive geological formation is most famous for its appearance in the 1985 film, The Goonies. 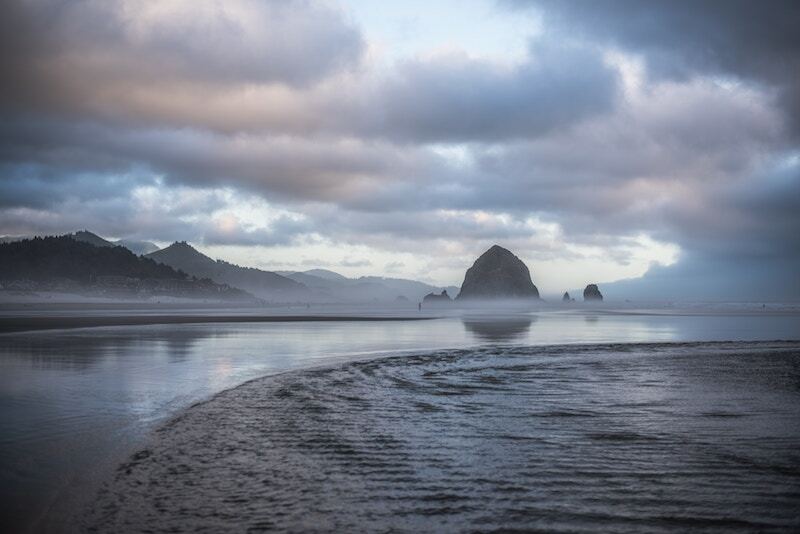 However, what draws people to Haystack Rock is the stunning Oregon Coast backdrop and the charming town of Cannon Beach. During low tide, you can walk right up to the rock and see colorful sea stars and tide pool creatures. Puffins are also common from early spring to mid-summer. Do you and your partner enjoy scenic views of deep river canyons and cathedral-looking basalt cliffs? Then add Smith Rock to your list of potential proposal spots! This state park (and one of the 7 wonders of Oregon) is known as the birthplace of American sport climbing. Even if you’re not a rock climbing aficionado, Smith Rock is a must-do experience. Hiking Misery Ridge will give you the full Smith Rock experience. On a clear day, the top of this loop trail presents an expansive view of the surrounding mountains, and would make the perfect proposal spot – especially during sunset. If you’re trying to choose between proposing near a lake or somewhere with mountain view, why not have both? Trillium Lake is beautiful all on its own, but the stunning Mt. Hood backdrop is what makes this place special. As you get further into fall, you may even get some snow! This is a drive-up lake and campground area, but if you’re looking to get away to somewhere quiet, you can find a spot somewhere around the perimeter of the lake, a 2-mile loop. Abiqua Falls is a lesser-visited Oregon waterfall – but only because it takes a bit of work to get there. If you and your partner love an adventure, Abiqua Falls would be a wonderful proposal spot. You’ll need to offroad a bit to get down to the trailhead. From there, it’s a simple (but very steep) out and back hike to the falls, less than a mile, total. As soon as you round the corner to the falls, you’ll be met by a 92-foot waterfall framed by a stunning basalt amphitheater unlike any other in Oregon. We love unique proposal ideas, and a scenic Oregon flight tour sounds like such a romantic and special experience – especially during sunset or sunrise! There a many companies throughout Portland that offer tours from the sky. Choose from flights that show off nearby waterfalls, the Columbia River Gorge, Mt. Hood, Portland, and more. Whether you go with a plane, helicopter, or hot air balloon, your proposal in the clouds is sure to be the envy of couples everywhere! St. John’s Bridge is considered by many to be the most beautiful of all 12 Portland bridges. However, many don’t realize that there’s a beautiful park underneath the east side of this bridge! Cathedral Park is named after the appearance of the large Gothic arches that support the bridge. Not only is this a beautiful spot (especially in the fall) for a proposal. It’s also steeped in history. Cathedral Park is believed to be one of the 14 Lewis and Clark landing sites in the area. And somewhere in the park is a time capsule, sealed in 1980 and scheduled to be opened in 2030. If you envision an awe-inspiring engagement, then situating Crater Lake in the background of your proposal may be exactly what you need. 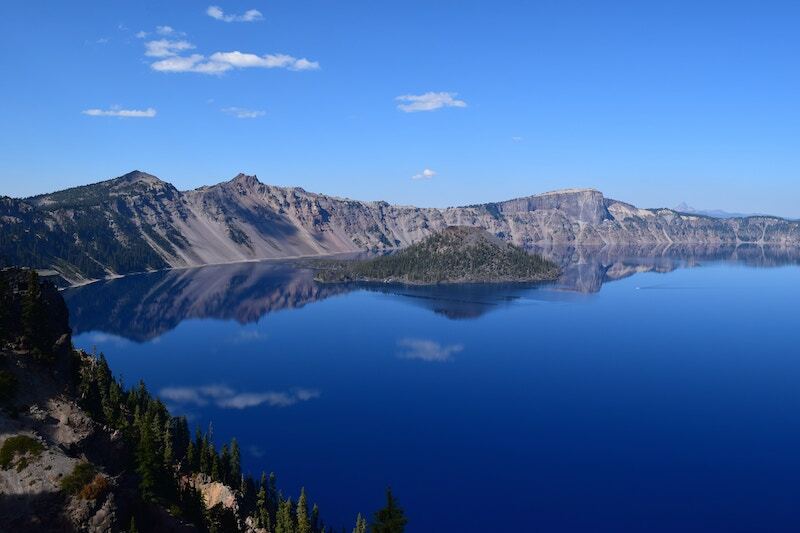 At 1,943 feet, Crater Lake is the deepest lake in America – and also one of the most beautiful. The water’s blue color is stunning and the surrounding rocky hills and old-growth forests are breathtaking. This area is open year-round, but the beautiful colors of the fall make it our favorite season for taking in the view. Named for the delicate layers of red, yellow, gold, and black soil, the Painted Hills almost make you feel like you’ve stepped onto another planet. Seeing this area is a one-of-a-kind experience. In addition to offering a truly unique and special view, the Painted Hills are a great proposal spot thanks to the lack of crowds. You can certainly find space all to yourselves. Keep in mind: The colors of the hills shift and change with the difference of light. We think the area is best viewed in the afternoon, when the sun makes the colors of the hills incredibly vibrant. If you and your partner are the type of couple who can’t turn down a great photo-opp, a proposal at the Insta-famous Rowena Crest is a great idea. There’s a reason this unique horseshoe curve in the road has garnered so much attention – the surrounding landscape is stunning! Suring the fall, a short walk up the hill offers sweeping views of hills, cliffs, forests, and the Columbia River Gorge below, all covered in orange, red, and yellow. Decided On the Perfect Place to Propose? Now it’s time to find the perfect ring. Our team at Malka Diamonds would love to help you pick out a ring to complement your perfect fall proposal. We offer a carefully curated selection of designer and vintage rings, and our specialty is creating unique, one-of-a-kind custom rings to match your one-of-a-kind love. Learn more about who we are, or visit us in Downtown Portland. Newer PostLoren and Gil are engaged! Older PostCongratulations Joe + Ali!